One of the best facets of summer are its refreshing caffeinated creations. 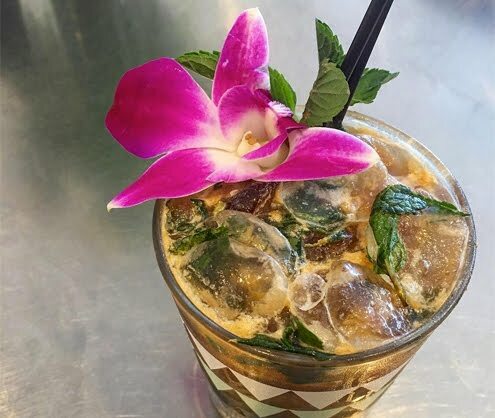 Though I tend to be a purist when it comes to my coffee, I have grown to appreciate a well-made concoction, especially when it's cold and refreshing, as there's something almost transcendental about a great iced beverage with a splash of quality coffee. One creation that recently caught my eye came from the wheelhouse of Cup and Spoon's menu innovator Alicia Bigford. The drink, called an Ethiopian Guava Smash, uses a bright mix of an Ethiopian espresso from Littlefoot Coffee paired with guava, lemon, and muddled mint, then served over ice and garnished with a flower. For those that would like to sip this drink at home, Cup and Spoon has graciously passed on the recipe below. Try it out for yourself, or just stop by their shop and order one. A refreshing blend of bright Ethiopian espresso coupled with sweet fruit flavors, served over ice. Wow!Interesting post.Its about Ethiopian Guava Smash.Thanks a lot for sharing this and love to get these details.Thanks.An essay is a well researched and logically structured answer to a particular question, or questions, usually presented as an argument. It is a point of view formulated by critically assessing the information or ideas relevant to the essay to make an excellent essays.Refer custom essay writing services for making your essay best one.